Pakistan inspired performance from Mohammad Amir and Saeed Ajmal, 2nd Innings England 221/9 in 76.2 overs, England lost their last 6 for 26 to leave their lead on a precarious 146 when bad light ended play. on the 3rd day of 3rd Test Match at the Oval. on Friday, 20th August 2010. England When Cook was flowing for the first time this season on the way to his 13th Test century - and his most important - adding 116 for the third wicket with Jonathan Trott, England were on course to set a very testing fourth-innings run chase, but for all the failings of this current Pakistan team they still possess the ability to spark rapid collapses. Pakistan gave themselves an outstanding chance of a victory that will keep the series alive after an inspired performance from Mohammad Amir and Saeed Ajmal. England 1st Innings 223/all out; 62.3 overs. 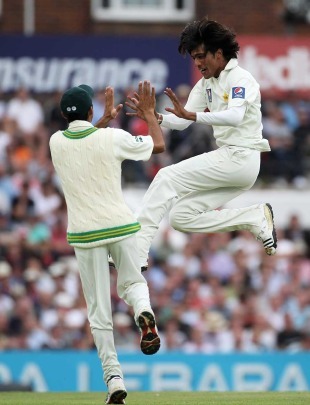 Pakistan 1st Innings 308/all out; 100.2 overs. England were 221 for 9 at the stump of 3rd day with Broad 6 and Finn 0 Seef Ciriez. Pakistan Mohammad Amir and Saeed Ajmal 4 wicket respectively.